Ever feel like some days, no one gets your sense of humor? See my coffee shop is not the uptight corporate coffee kind of place. We all get along, and while we work really, really hard, we all have a good sense of humor and goof off a lot too. A couple months ago, this woman came in, and I swear, the second sentence out of her mouth was, "I'm from San Fransisco". Which wouldn't sound odd, except it was in response to, "What can I get for you today"? Customer:"What the heck? You guys used to accept beaver pelt"? Me: "What? Oh, no, that's a joke"
Me: "Yea, I know. It's just a joke"
Customer: "Man, I knew I was in backwoods Indiana, but this is crazy". Me: "No, not that backwoods. It's just a joke. One of our employees put it up there as a joke. Like, instead of we don't accept out of state checks. 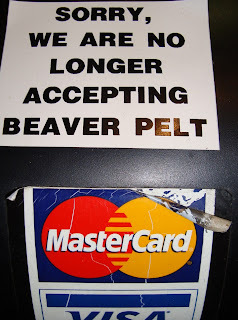 We don't accept beaver pelt". Customer: "How long ago did you stop doing it"? Me: "Is this like, a hidden camera show"? Me: "Here's you drink, have a great day"! I know, that's just one oddball right? Except for the past two weeks it keeps happening! Not that extreme, but a lot of, "I don't get it", and "what's pelt"? Maybe it's good that we all work together, since we're the only ones that find each other funny! That is extremely hilarious although sounds very frustrating...People can be sooo stupid. So no one learns about fur traders, Native Americans, and that stuff in school anymore? Geez..do you accept beads since I can't trade in beaver pelt anymore? Living close to S.F./Berkley now, I can say I'm not too surprised this happened. There's a curious illness that seems to overtake a few "well traveled" activists in this area. It appears that once he/she decides someone has nothing of value to say (often determined prior to initial conversation and based solely on things such as gender, politics, religion, place of birth, etc...), the activist will simply lose the ability to hear anything other than the sound of his/her own voice. Truly strange. As to the rest of your issues with the sign... *shrug* Kit's probably right. Personally, I think the sign is quite funny. Here I was, combing my pelts out, so I could get a good cup of coffee and I get nothing but signage for my parched throat. Hee, hee, hee! I get it! This is why I love you guys. And, I guess, why I didnt much care for Cali. Keep keepin on...we have a sense of humor. Seriously, Joan, you've got to stop destroying my faith in human nature.